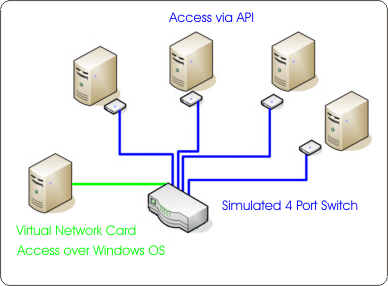 With VirtualNetwork is it possible to install a virtual network card on a Windows system. A four port switch will be simulated on this network card. Over a API is it possible to send and receive packets on the mac level. 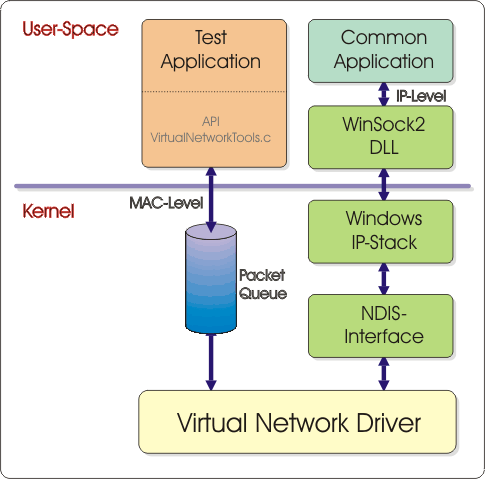 VirtualNetwork is used to simulate and test netzwork protocols on MAC level dirctly in Windows. It is also possible to run TCP stacks such as LWIP on a VirtualNetwork interface. Against the loopback interface which only allows accesses on the ip level, VirtualNetwork send and receive all packets on the MAC level. The full network traffic can be recorded with tools such as Wireshark. The LWIP-Demo contains a proting from the LWIP TCP-Stacks 1.4.1 with several extensions. One feature is to prior several TCP ports. The sockets for the select funktion are optimized. In the full stack realtime logs will be recorted. This logs (see at TcpTester.cpp) will be stored as a *.tte format. The viewer for this format isn't in the demo. Extract all files from the Zip file in your MyProjects folder. Set the ip address of your virtual network adapter to 192.168.99.10 / 255.255.255.0. Over a console window you can ping the demo on 192.168.99.80 over the network card. Additional the project NtpRouter.dsw can be started. Now the VirtualNetwork demo can send a time synchronization over the NtpRouter. A small WEB server is on "http://192.168.99.80" implemented. Extract the LWIP demo from the ZIP file in your MyProjects folder. Compilie and start the project LwipDemo.dsw. On the IP address 192.168.99.33 at TCP port 7 is an ECHO server installed. A WDK (Windows Driver Kit) must be installed.